Bad Breath or Halitosis is one of the major problems which not just makes one feel uncomfortable, but also shy when talking to someone directly. Many of you won’t get the smell from your own mouth, and might be complaining about others unless someone says it’s your mouth which is giving that foul smell. You can assess whether you have a bad breath, but that would need some knowledge and technique, and assistance from someone sometimes when you cannot still assess and understand whether the foul odor is really from your mouth or not. Here are the various ways how one can test for bad breath at home, with a help of few regularly used items. One of the best ways to check whether you have a bad breath is by asking your trusted friend or close ones who would be frank in testing and letting you know whether they are getting a bad odor from your mouth. It is not just an easy, but a very accurate method of assessment. If your friend isn’t able to detect it, but someone else still feels that the odor is unpleasant, then your Dentist can do the best testing and even suggest you the best ways to get rid of it. Lick the back of your hand with your tongue, and then let it dry for the next 5-10 seconds. After that, smell that part of the hand and if you feel some bad smell from there, then that is due to the sulfur salts that have been transferred from the tongue to the hand, and these are the salts that are responsible for the Halitosis in your mouth. If there is no smell, pleasant or unpleasant, then you have no bad breath, but if there is some minty smell, you might have brushed sometime back and it is that smell which would remain for a couple hours. Scraping a tongue with either the tongue scraper, or a spoon would be a good way to collect what’s on the tongue and see if there is any bad breath. Scraping of the tongue can be done even using a Q-tip, or a cotton swap or a piece of gauge and apart from the tongue, the surfaces of the teeth, the inside of cheek and the gums can be scraped to get a general idea of the smell. Cover your mouth and nose with both the hands, such that a small gap remains between the hands and the mouth, and then after you take the breathe in, breathe out into your hands, and see if it smells bad. This is not a very accurate method, but still a useful one in self-assessment, where you can pull your cheeks out away from the teeth, and then push them towards the teeth, do that repeatedly faster for a few times, and then sniff up at the same time and if that smells bad, then your breath is probably bad. You need to stand in front of the mirror, and try to stick your tongue out as far as possible, and here you are checking for the color on the back of the tongue. 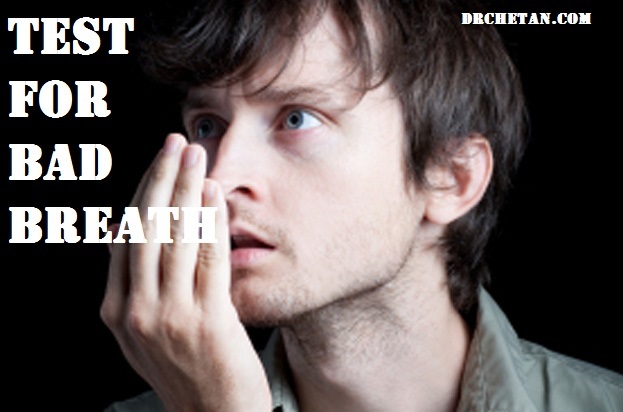 If it looks whitish, that is a sign that you have a bad breath, and that area is not being cleaned well. Run a dental floss between the teeth, and do that for most of the teeth of yours. After flossing, smell the wet area of the floss and see if there is any foul odor, and if there is then you are probably having a bad breath, due to the accumulation of food in between the teeth. These were the various self-assessment tests for bad breath, but if you still have a doubt about it you should be visiting a dentist who would do the best way in not just check for the bad breath but suggesting and doing a perfect treatment for the same. Check out the basic steps that would help in preventing bad breath, and the various causes of bad breath which are all to be known while assessing for the foul smell in the mouth. Other worth reading articles include foods causing bad breath, and the liquids causing bad breath.